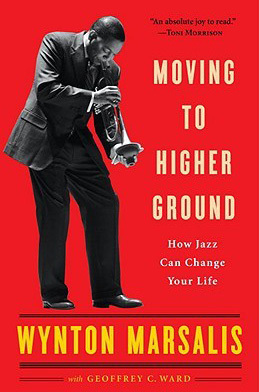 A study of the writing style and themes in Wynton Marsalis’s book, Moving to Higher Ground, How Jazz Can Change Your Life. This is a non fiction unit aligned to the English Language Arts (ELA) Common Core State Standards (CCSS) and the schema of Bloom’s Taxonomy. Essential questions are also provided in the Teacher’s Study Guide. 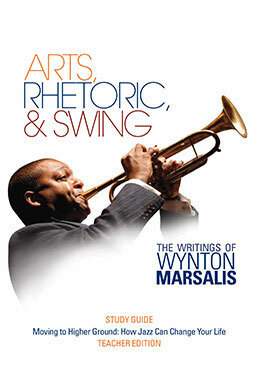 Using the Study Guide as the foundation for teaching and learning, the unit provides a close study of the rhetorical strategies and literary techniques used by Wynton Marsalis in his book, Moving to Higher Ground, How Jazz Can Change Your Life. It also focuses on Marsalis’s themes pertaining to arts, music, education, and culture. The Study Guide includes chapter summaries of the book, ELA questions based on close reading research, and discussion questions for each chapter. There is also background on Aristotle’s rhetorical strategies and philosophical approaches to the arts. Access to online audio and video supplements is also included. The following teaching strategies, as defined by the National Center for Educational Outcomes, will be used in implementing the unit. The pre-test should be given on day 1 of the unit to assess prior knowledge of language arts, rhetorical, and thematic concepts. An informal discussion on non-fiction, rhetoric, writing style, etc., will help teachers gauge students’ knowledge of the unit’s content. The language arts and discussion questions at the end of each chapter serve as the foundation for understanding the figurative language, style, strategies, genres, etc., in the book. Discussion questions lead to a further study of the integration and value of the arts in general, and foster self-reflection and reflection of societal and artistic norms. The language arts questions are designed for students to develop a “close reading” strategy. The concept of close reading is a researched proven and Common Core Standards recommended tool in which students are encouraged to examine the text in a way that assures comprehension and analysis. (David Coleman, Susan Pimentel: Publishers’ Criteria for the Common Core State Standards in English Language Arts and Literacy, Grades 3–12; 2011.) While the students sometimes label the questions as a “seek and find the answers” activity, the questions are designed to compel the student to identify, analyze, and respond to the writing style and themes of the author. The discussion questions are much more open ended to allow and compel the students to articulate their feelings and knowledge about arts, creativity, culture, social norms, etc. These questions provide an opportunity for the teacher to individualize the learning and instruction by allowing the students to choose which questions they want to address. Students can work individually or in a group composed of others who share their interests. Teachers can balance the assignments based on interest as well as specific standards that specific students need to master. Student study guides provide chapter by chapter summaries for readers who may struggle with the larger text. Language Arts questions can be narrowed to cognitive ability level. For example, a student can be assigned to find a metaphor without having to analyze it. Teachers can empower students to choose which discussion questions they will answer based on interest, cultural, gender, or academic preference. Tests can be administered open book. Students should read portions of the text every night. A persuasive writing assignment or other essay will be completed for homework. Mini research assignment based on reading or verbal research will be completed for homework. End of chapter Language Arts or discussion questions. The text, Moving to Higher Ground, How Jazz Can Change Your Life, is ready made for interdisciplinary study as Wynton Marsalis integrates facts and opinions regarding American history, music, the arts, philosophy, and education. Study questions in the guide frequently offer outlets and assessments for students to articulate their knowledge on different subjects and to find the interconnectedness of language with the other disciplines. The vocabulary lessons focus primarily on defining, understanding, and analyzing literary terms and techniques. A glossary of these terms is included in both the student and teacher study guides. A. Students will be able to define, identify, and analyze: stereotypes, imagery, audience, anecdotes, irony, cliché, metaphor, and connotations. B. Students will discuss the importance of jazz in American culture. C. Students will be able to articulate their opinion on the inclusion of the arts in educational curriculum. D. Students will be able to infer, interpret, and paraphrase the author’s message. E. Students will be able to role play themes regarding race and age. A. The main focus of this lesson is to encourage students to examine and articulate their attitudes and experiences regarding race—while keeping in mind Marsalis’s experience and attitudes. B. Make sure the students know and understand the language arts terms from chapters 4 and 5. Teachers may just provide answers to the Language Arts questions for these chapters. C. Assign groups to answer the Questions for Discussion at the end of chapter 5. Responses are to be written and handed in. D. Ask for volunteers to act out (role play) the race scenarios for this lesson. E. Discuss reactions to the role playing. VI. Homework—Finish reading book by Lesson 12.